All Michigan State University facilities have a locatable address. Visit the MSU Campus Addresses for more iinformation. The U.S. 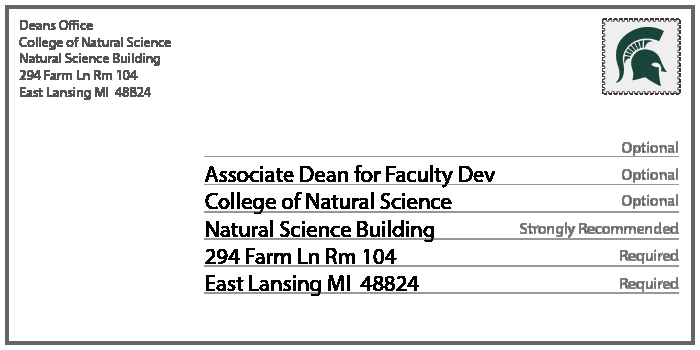 Postal Service has asked MSU to refrain from using ZIP+4 codes since they change frequently and rather than one ZIP+4 per building, there may be many. USPS has indicated that all mail will be delivered correctly without using the 4-digit codes and it is not necessary to include it on letterhead, business cards, or envelopes. There are, however, certain units that require the ZIP+4 when performing the day-to-day business operations of the university. All university business mail must include a return address—which is also a security requirement of the USPS.